On launching the updated app, users will now see a series of quick-access buttons for finding things like images, videos, restaurants, and nearby points of interest. That Near Me page displays its own category shortcuts, a deal carousel, and prices and ratings as appropriate. When running manual searches, the app will display Google Now-like cards if possible, instead of simply presenting a series of links. In a similar spirit, the app now caches bookmarks and search histories, making it possible to find some items without a Wi-Fi or cellular signal. Microsoft is also promising better touch and voice navigation in the app's interface. App hooks let users jump into iOS apps better suited to some given requests, such as Fandango when buying movie tickets. 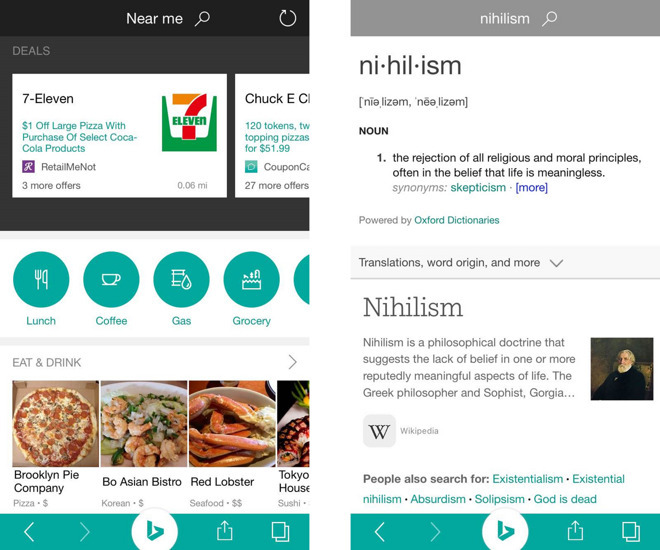 The new Bing is a free download, and requires an iPhone or iPod touch with iOS 8.0 or later.